Lambswool ladies cable waistcoat. Machine washable. Sizes S-XL. I have been buying from Country Collection for more years than I can remember, because you are always reliable for well-made clothes in quality materials that fit well and last for years. Styles and prices are right for every-day wear. And I love the very warm cable waistcoat that I have just bought. Like all the knitwear I’ve bought from Country Collection over the years, this waistcoat is no exception. Very well made, and fits well. Please would you consider selling this one in a denim blue? 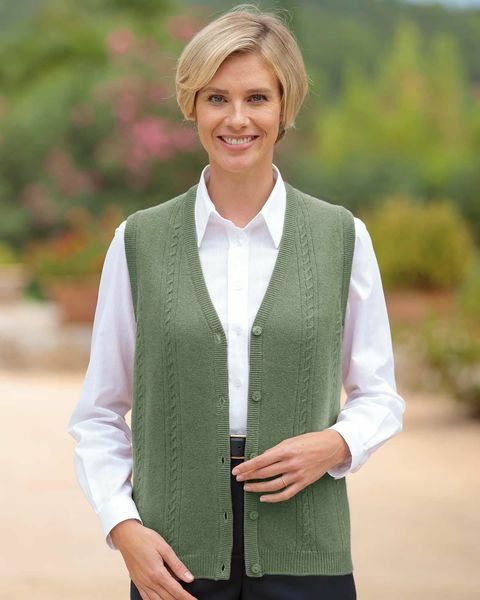 Ladies new style waistcoat, knitted in pure lambswool. Front cable detail with tonal buttons. Ribbed welt and armholes. Bust (Actual Bust Measurement) XS-39", S-41", M-43", L-45", XL-47"
"I have been buying from Country Collection for more years than I can r ..."